-86°C (-122°F). It can be placed in small and large freezers of varying configurations. The system provides a complete stand-alone temperature mapping and validation solution for freezers to ensure uniform storage and testing conditions. The OM-CP-ULT90 includes a USB docking station with 1.8 m (6') of cable (OM-CP-IFC300), the OM-CP-CRYO-TEMP data logger, and FDA 21 CFR Part 11 Secure Software and IQ/OQ/PQ validation protocols. For larger freezers, loggers can be plotted in one graph to show variances in different parts of the freezer. Finally, as failure to monitor external freezer temperatures may invalidate internal freezer temperatures, an additional OM-CP-CRYO-TEMP can be included for placement outside of the freezer. 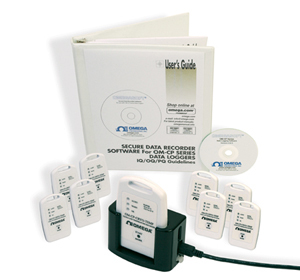 참고: Comes complete with data loggers, NIST calibration certificates, USB docking station, batteries and Secure Software. For more information on the OM-CP-CRYO-TEMP, please visit omega.com.